Zoey hangs out wherever she wants, loving the spoiled life. I don’t wish anything different about myself. I only wish I had more admirers to drive up my cuteness factor. “Just a little,” or “She is spoiled,” Shelley will say in response. Spoiled? I think not. I deserve treats. I deserve to be carried on walks if I don’t want to get my feet cold or am a bit peeked. And I deserve to get presents for my birthday, Christmas and any dog-related holidays. In other words, I deserve to be loved, admired, cared for and pampered. • Kiss me in the morning. • Let me kiss you back with doggie licks. • Give me treats whenever you leave. • Kiss me before you leave. • Don’t leave me for too long. • Come back and let me know that you missed me. I certainly let you know that I missed you with my tail wags and exposed belly. 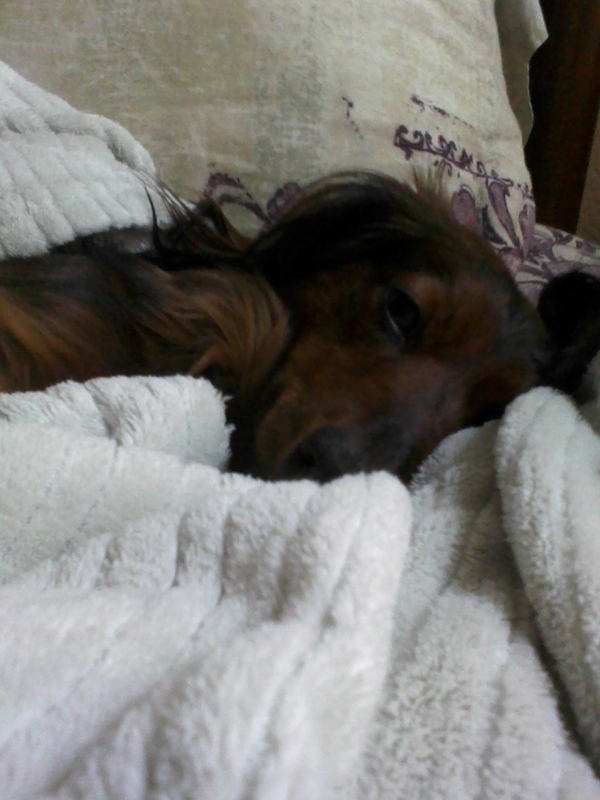 • Make sure my blanket is set up on our bed, so that I can have extra softness for sleeping. • Take me on walks, but carry me when I’m tired (see above). • Love me all the time. • Tell me how cute I am, or did I already say that? 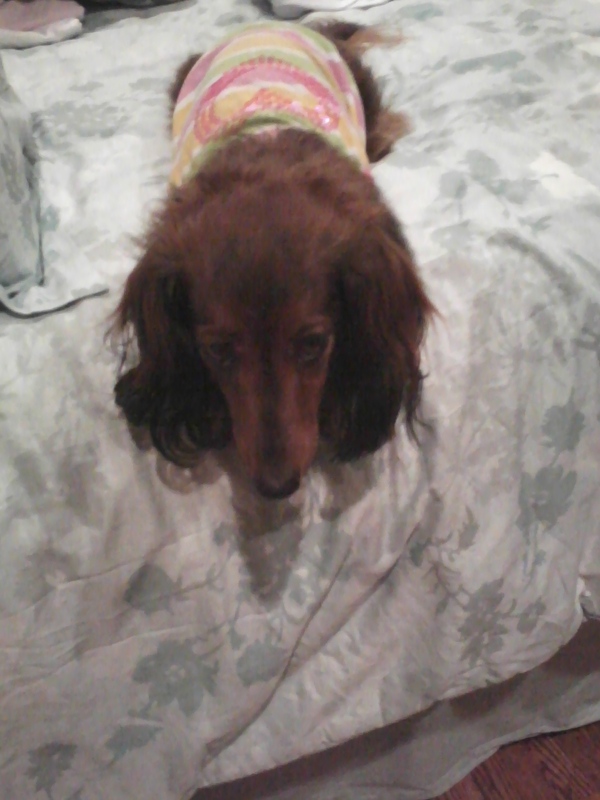 Zoey the Cute Dachshund is sad that the neighbor cat doesn’t want to be friends. I don’t get rejected, well, except by cats. I got scooped up and taken away and was returned to the garage, boxed in again away from all the potential friend sources. What a way to feel rejected. 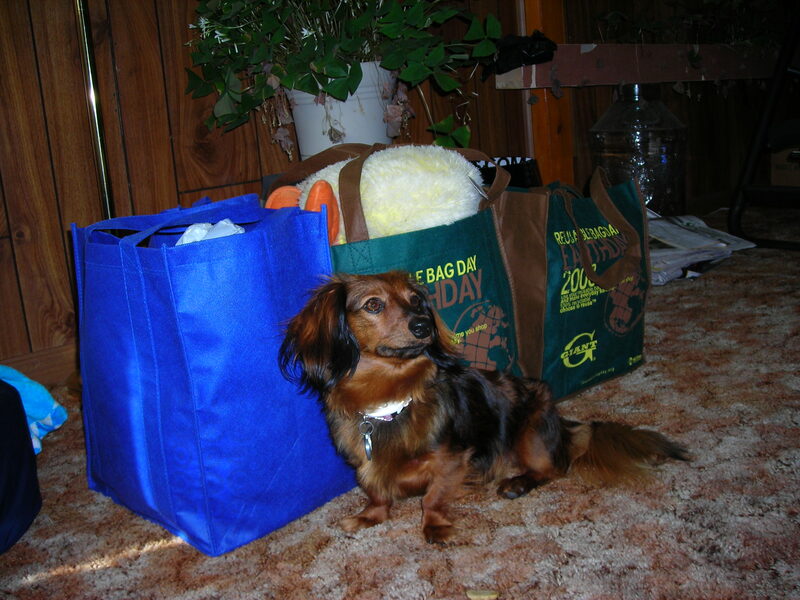 Zoey awaits by her packed belongings prior to a trip. • Treats in the cupboard, including chewy, flavored bones, milk bones and chews of all shapes and sizes, plus my organic, healthy, passable dog food. • My teddy bears, including White Dog, who I use for my zen moments before bedtime by biting his neck and sliding my feet back and forth, just like I did when I was a puppy with my momma. I emit long high-pitched sighs as I release the tensions of my day. Plus, I have two hedgehogs, one for throwing and chasing and the other for tug-of-war, a long wiener dog toy (I’m a dachshund, not a wiener dog, BTW), a bunny and lots of balls. • Two nyla bones, one for the living room and one for the bedroom. • A Frisbee that I like to chew rather than catch mid-air. I like catching balls, but Frisbees make for good chewing, well until they’re taken away and put in the trash bin. This list is all I need. I don’t need to put stuff in storage or in the basement or have collections of the same thing. I live a pretty simple life, because I’m not building my world out of and attaching meaning to my possessions. I’ve even lost some toys (I’ve been told they were old, smelly and ripped), but I can’t remember them, so this means I’m unattached. But that’s the life of a dog, I suppose. I’m sleeping very comfortably. Yum! 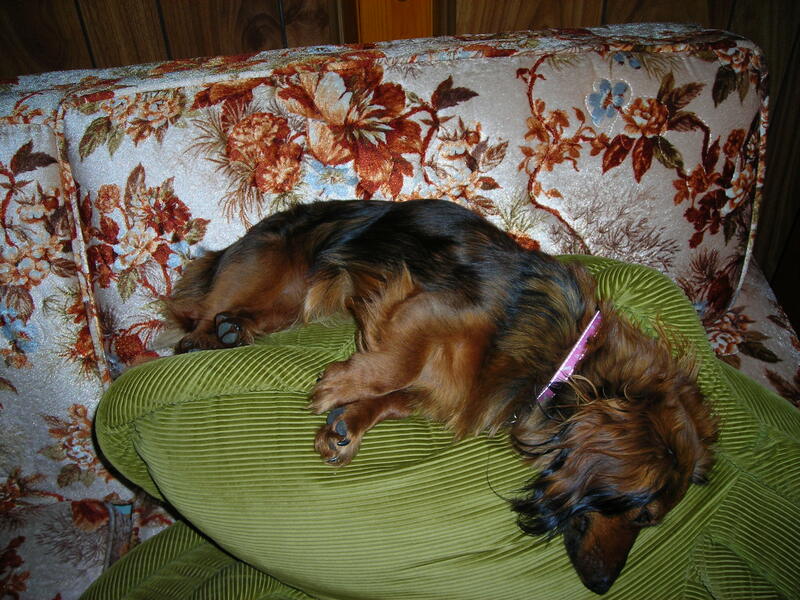 Shelley, my BFF, was sick on Wednesday with a bad cold, chills and dizziness, so she stayed home all day. She was in bed with me, and I didn’t even go outside, because I wanted to make sure she was all right. I followed her to the kitchen, but did she share? It was spicy microwave food. No, I didn’t remember not liking anything. I waited patiently by her chair, and she just ate and went back to bed, forgetting something important: feeding me. I followed her. Where’s my treat? I pleaded with my eyes. She just slept, and then she got up and started reading, still in bed. I liked this, my bedfellow and I staying inside on a sunny spring day. And, of course, I barked at all the sounds. The bonus was that Shelley apparently was too tired to tell me to be quiet. So, when is the next sick day?